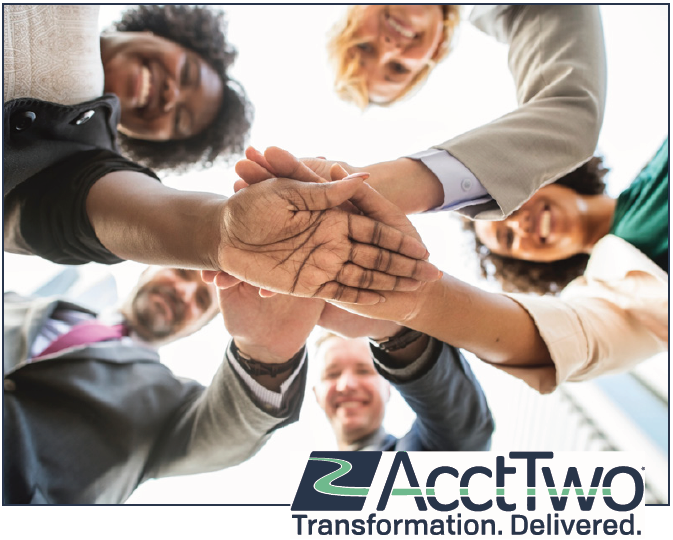 When you choose AcctTwo, you join a community - a community of other customers, AcctTwo employees, and partners. As the “curator” of the community, AcctTwo works hard to bring the skills and experience of each community member, internal and external, to the forefront - through introductions, education, consultation, and general help. The idea is that through a strong community each person using Sage Intacct will receive unwavering support. The success of each person using our Sage Intacct-based accounting solutions - from staff accountants to controllers to CFOs and requisitioners, sales executives, and management, drives everything we do at AcctTwo. We have learned that this success ultimately is measured by each person’s continuous improvements in productivity and the ability to deliver real-time decision support to key stakeholders. After implementing Sage Intacct for more than 800 organizations, we have learned, firsthand, that in order to realize the expected payback from Sage Intacct, each user needs help at different points along the way. We have made sure these questions can be answered for every registered user of Sage Intacct through our Unlimited Help Plans - questions about current configurations, reporting, data integrity, functionality, and many others. With an Unlimited Help Plan, you have the freedom and confidence knowing you will not be charged for these type of questions. Every AcctTwo customer is enrolled in an Unlimited Help Plan based on what is included their subscription. Suggest workarounds and/or feedback related to an error message from Sage Intacct. Error messages typically are generated by Sage Intacct due to data entry or business process issues. Report product defects and/or outages. If it is determined that the product is not working as documented, AcctTwo will submit a case to Sage Intacct for resolution. Cases will be assigned priority based on the severity of the impact to the company. Sage Intacct Health Checks, performed by your AcctTwo Customer Success Manager, to monitor the use of Sage Intacct and to help ensure optimal use of the solution over time. These Health Checks, which are performed during a one to two-hour meeting, follow a standard checklist to assess usage patterns, value received, and overall satisfaction. Discounts off an annual Sage Intacct Business Success Review. These Success Reviews are approximately 20-hour engagements with a senior AcctTwo consultant to review how well the needs of the organization are being met by the current configuration and to provide insight into how enhancements of Sage Intacct could deliver greater value to the organization. Passes to Sage Intacct Advantage, Sage Intacct’s Annual Customer Conference. Unlimited Help Plans are not intended to replace training. Each Sage Intacct end user will be expected to receive proper training either through Sage Intacct, AcctTwo, or an experienced colleague. Unlimited Help Plans are not intended to replace project work. Examples of project work may include building a report or dashboard from scratch or adding a new transaction definition to support a new business process. Unlimited Help Plans are intended to help troubleshoot reporting issues and to suggest ways to get to the root of the problem. Unlimited Help Plans are not intended to provide reconciliations (e.g. Ledger vs. Sub Ledger or Income Statement vs. Balance Sheet) that may be required to confirm resolution of data integrity issues. AcctTwo is focused on delivering the future of finance and accounting to its customers. AcctTwo has three main solutions – Cloud-based Accounting Software, Managed Accounting Services, and Software Development, all built around Sage Intacct’s best-in-class financial applications. Our dedicated team of more than 100 people has helped more than 800 organizations optimize finance and accounting through software implementations, accounting outsourcing, and consulting. AcctTwo has been recognized by Sage Intacct as its Partner of the Year from 2014 – 2018 and by our customers as the leader in overall satisfaction through their reviews on G2 Crowd.